A somewhat funny movie with definite larry david / seinfeld tendencies, and some witty humor. 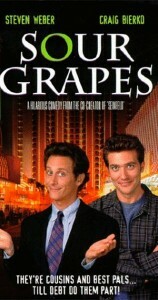 Sour Grapes isn’t as funny as it should have been. the movie was written and directed by larry david, right in between his career as a writer for tv’s show seinfeld, and his job both writing and starring in his own show, curb your enthusiasm. 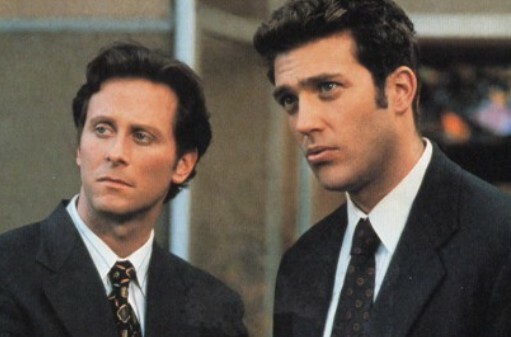 david had worked for the seinfeld show for many years by the time he made this movie, and he was definitely in control of his craft. but the problem is, like a typical seinfeld episode, not all of it is funny. sometimes it’s funny and sometimes it’s stupid. now imagine not having george and kramer and the actors who make these characters so lively. 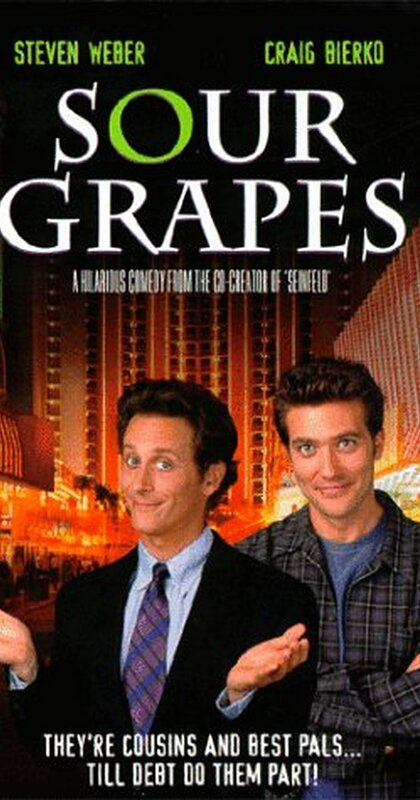 the actors in sour grapes are no george and kramer. they aren’t especially good or funny, and that doesn’t help the movie along much either. there’s craig bierko, best known for playing the villain in the gina davis action thriller, the long kiss goodnight, and then steven weber, from tv’s wings. neither one of these guys is anything special. the two of them play best friends and cousins who go to a casino together one day to get away from their problems. they sit at the slot machines, side by side, and keep dropping coins in mindlessly. when bierko’s character, ritchie, runs out of quarters, he asks his friend, evan to borrow two. can you guess what happens. ritchie wins a jackpot. he’s happy and evan pretends to be happy for him. but really he’s thinking that ritchie should be giving him some of the money. this becomes the plot line of the movie. the question that is on the table is if someone loans you the money to win, is half of their winnings yours? considering how much this question is a part of the movie, all of the reasons and answers don’t actually get explored enough. for example, only two real opinions come out in the movie. one is that ritchie owes evan two quarters, and nothing more. the other is that evan says, “i could have just put those two quarters into my own machine and won myself.” Wrong. evan is completely wrong because it was the machine that won, not the area of the casino. just because one machine wins doesn’t mean that the machine next to it could have also won. i would agree that if the two of them were standing over the same machine together, then yes, evan could have put the quarters in, but that is not what happened. another idea that never comes up is that evan should have said something when he gave ritchie the coins. he should have said, “if you win, half of it is coming to me.” i’m not saying any of this matters, because ritchie should be giving evan some of the winnings no matter what, but at least that idea that evan should have called it, should come up. instead we hear the same tired arguments again and again. we hear over and over again that ritchie owes him two quarters and nothing more. or evan’s arguement about how he could have put them in the machine himself. luckily the plot does move on from this, at least a little bit. the guys each have a girlfriend who they take to the casino with them, and both girlfriends get tired pretty quickly about the argument. neither one of them supports her man, and both feel the whole thing is pretty stupid. they both have a “who cares,” kind of attitude, and a “just forget it and move on,” way of looking at the situation. naturally this only infuriates the guys more. especially evan who can’t believe his own girlfriend doesn’t agree that ritchie owes him some money. the group leaves atlantic city and goes back home where things get somewhat interesting. in what is undoubtedly the funniest scene in the movie, ritchie goes in to see his boss, phillip baker hall (the library cop named bookman from seinfeld, and the doctor on curb), and quit his job. but the scene actually becomes about witty banter as the two of them go on to insult each other. Hall owns the scene, calling ritchie a bad soul designer (he designs the souls of shoes), and telling him “that’s it, get out, you’re fired.” it’s hall’s timing and delivery of lines that is so flawless. but even their discussion about what the soul of the shoe looks like with circles inside other circles, is pretty funny. credit should go to larry david here, for never actually showing the soul. david would repeat this technique again and again in both curb and seinfeld. in seinfeld, he has george invest in art that is really just a bunch of triangles, and in curb, larry has to write a recommendation for a guy who makes art work that is just geometric shapes. in all of these examples, the shapes are spoken of, but never seen. it’s a very funny concept. unfortunately, this is phillip baker hall’s only scene in the movie. it’s a standout scene, far funnier than anything else in the movie, although there are some other moments that come close. one involves a patient who has just seen the doctor (evan) and now wants to ask out the receptionist on a date. his problem is that he was just in his underwear in the room with the doctor and the receptionist walked into the room and saw him. that’s their policy at this doctor’s office, but since this patient had a different agenda in his mind, instead of just going there to get a check up, he’s got a problem with it. the whole idea becomes very funny, especially when the patient does get up the nerve to ask the receptionist out and has to deal with the results. while all of these small subplot scenes that really don’t have much to do with the story are very funny, the scenes that do go with the story are often kind of dumb. evan is ritchie’s doctor and out of anger over the whole money thing, he calls up ritchie to tell him that he has cancer. that’s not very funny. and then ritchie freaks out, thinks about how his grandma won’t be able to live without him, and decides to try to give her a heart attack himself. what? it’s really, really stupid. ritchie hires a local homeless guy (orlando jones) to come into his grandma’s house when she is home alone at night. the whole thing gets to be a mess and the only thing good that comes out of it is that a funny black detective comes on the scene to start asking questions. when he interviews the old white couple and they have to describe the man who they saw running away as a black guy, but are afraid to say that, it’s another great moment. and the detective plays it perfectly. sour grapes has definitely got some things going for it, but unfortunately most of that is not part of the main plot. whether it’s the actors who were cast as the leads, or just that the central plot is more dopey than funny, there’s a lot about it that falls flat. but it’s the side players and subplots who keep things afloat. phillip baker hall in his one lone scene, the patient at the doctor’s office, and the black detective who’s seen it all, and can’t believe the idiots he has to interview for this job. those characters give this movie the edge it needs. and the central plot isn’t that bad, it’s just that it’s been done before and doesn’t really have any new insight into the situation here. i do like that the movie never became a sort of war of the roses, where the characters just kept trying to one-up each other by doing more and more terrible things to the other one. when evan gave ritchie the fake cancer news and then started laughing about it, i started to get afraid that the movie would end up going in that direction. luckily it didn’t. this movie was occasionally funny, and occasionally interesting, and all of that is enough to say that’ it’s an okay film.